It’s the one day of the week when she doesn’t touch water – not even in a glass – and the only morning the two-time Commonwealth champion swimmer permits herself the luxury of a lie-in… Sundays are precious to Hannah Miley, who has represented Great Britain three times at the Olympics. “I avoid water from Saturday afternoon until Monday morning,” says Hannah, who specialises in the Individual Medley – combining four different stroke types. “It’s the only time during the week that I don’t set my Lumie alarm. 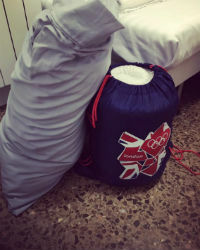 Like other athletes on the competition circuit, Hannah also practises what she calls ‘sleep hygiene’ – ensuring she has fresh bedsheets and a comfortable, supportive pillow that she takes with her everywhere she goes. Hannah returned to Sierra Nevada in January 2013 – taking her Duvalay Portable Mattress Topper with her. It has since become a regular fixture wherever she goes – most importantly, to all competitions. A self-described ‘creature of habit’, Hannah says she loves nothing more than working hard. In days gone by, her sense of achievement came from a new personal best or medals; today, she says it’s the personal gratification that comes from being involved in the sport, as well as the ability to travel, feel fit and be aware of her own nutrition and sleep. It’s this continual self-sacrifice that has seen Hannah selected once again for a major international competitive event, which is taking place next month. Although she is, quite naturally, feeling nervous, the good news is that it’s not impacting on her sleep. And having had the pleasure of speaking to this extraordinary athlete, who loves her sleep almost as much as we do, we have no doubt as to her level of effort or commitment. Best of luck Hannah from all at Duvalay!